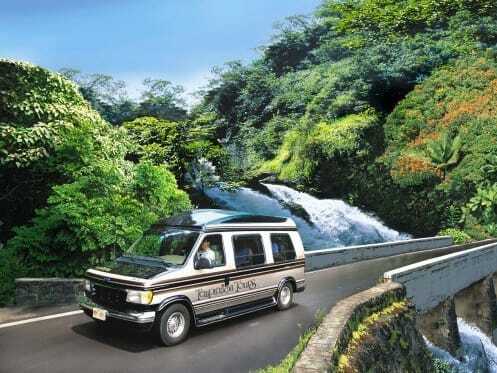 Start the day on the Road to Hana as you ride in air-conditioned comfort along this spectacular winding sea-coast highway. After touring the island's remote Hana coast, discover the incredible Kaeleku Cavern said to have been created by Pele, the Goddess of Fire. Discover elephant's foot stalactites and souffle-like lava swirls, all formed over 30,000 years ago! After the hike, enjoy a delicious lunch before swimming in a freshwater pool beneath a cascading waterfall. Make your way back to the "real world" at a delightful "Maui-style" pace. Choice of Tropical Island Fruit Juices and Coffee. Hawaii State Law requires children, ages 7 years old and under, to ride in a child safety seat or a booster seat when riding in a motor vehicle. Take a short hike to visit a ancient subterranean lava tube that was formed over 30,000 years ago. This is one of the largest accessible lava tubes on Maui. Swim in a fresh-water pool under a cascading waterfall or at a secluded beach (conditions permitting). You will be picked-up in a 6 to 8 Passenger, Luxury Limo-Van. Hawaii State Law requires children under 7 years old to ride in a child safety seat or a booster seat when riding in a motor vehicle. Advance notice is required. Yes, this activity is great for kids! Yes, you are able to bring your own lunch but please do not eat or leave any trash in the shuttle.